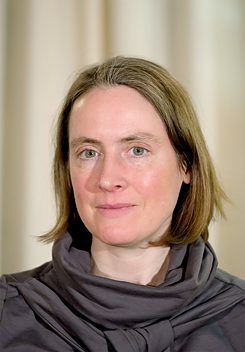 Isabel Fargo Cole was nominated for the 2018 Leipzig Book Fair Prize for her debut novel “Die grüne Grenze” (the Green Frontier). US-born Cole wrote her novel in German, and here she shares her thoughts about writing in a foreign language. A young couple moves to the Harz Mountains in 1973, a restricted area in the German Democratic Republic; their child grows up in a world where a lot remains. Isabel Fargo Cole was shortlisted for the 2018 Leipzig Book Fair Prize for her debut novel, Die grüne Grenze. Born in 1973, she grew up in New York City, but chose to write her first book in German and about Germany. In an interview, she talked about the challenges of writing in a language that is not your native tongue. Ms Cole, your recently novel about the final years of the GDR has garnered a lot of praise. Many reviewers emphasised your vivid use of language. You write in German, though English is your native tongue. That seems fairly unusual. It’s not as unusual as you might think. The number of authors writing in German as a second language is growing steadily. Germany is a country of immigration. And if you live in an environment for half of your life or even longer, it is also relatively normal to feel at home in the language and use it to express yourself. ... but back then I was more invested in getting to know East Berlin. I absorbed all these stories from my East German circle of friends and was really intensely interested in the culture. That’s how I discovered a lot of East German authors and started translating their work. Isabel Fargo Cole | Foto: © picture alliance/Sebastian Willnow/dpa-Zentralbild/dpa Still, going from translating the writing of others into English to writing yourself in German is quite a switch. How did that come about? I should start by saying that I started writing as a child. As a teenager in New York, I was really into the fantasy scene and published a few stories. In Berlin, I continued to write in English for a long time, but it was difficult because I was pretty cut off from any kind of literary community. It felt like working in a vacuum. Then I started exploring issues around East Germany and unification, which was happening all around me. Writing about these topics in English felt like translation. I had to explain too much to an English-speaking audience, so the obvious solution was to write in German. Literary expression is the ultimate use of language. Do you feel that an author writing in a foreign language might have fewer forms of expressions at their disposal? Yes, you are working with more limited resources. But in some ways that actually helped me write. I had fewer words to deal with, for example, which really moved my writing along, especially at the beginning. English has an incredibly rich lexicon, much larger than German. There are so many synonyms; it is very easy to fall back on beautiful, less common words. As a teenager I always worked with a thesaurus. Switching to German helped me in this respect, as it forced me to deal with the substance and to write less decoratively. Did your work as a translator of German enrich your writing in German? Yes. When you translate, you have to really be attuned to how the German language works. And you find a lot that cannot really be expressed using the same means in English. Things like indirect speech and specific structures or word formations. Just the fact that German is a highly inflected language changes your point of view. You can always distinguish the object from the subject and the adjective endings are clear, so you always know who is doing what to whom. The relationships are clearer. You mentioned that some structures used in German are difficult to express in English. Can you provide an example? German syntax is more flexible, so you can use syntax alone to add emphasis. Some German-language authors write very sparse sentences, very minimalistic; they work with very subtle differences in syntax. This is how the first author I translated, Hermann Ungar, a Moravian-Jewish writer and contemporary of Kafka, wrote. His language is very reduced, very clear, but at the same time he adds emphasis very subtlety so that it never sounds monotonous. This is incredibly hard to translate into English, because English sentences always have to follow more or less the same word order. This can make it sound clumsy and wooden. Ungar’s work made me aware of this technique, and at some point I wanted to use it in my own writing. I actually wrote my first piece in German while I was translating Ungar. Some authors who write in a second language use their linguistic background for stylistic effect. Do you? I might express myself in an unusual way from time to time. I also like to play with the syntax, but I don’t really want it to sound particularly English. Nobody likes to be put in a box and the Anglicism box is already very full in German. You can play around with it of course – in keeping with the lovely, funny tradition of ‘Denglish’ - but I want to head in a different direction. Judith Reker works as a freelance journalist in Frankfurt am Main. Copyright: Goethe-Institut, Judith Reker . This work is licensed under a Creative Commons Attribution – Share Alike 3.0 Germany license.